Congratulations to Natalie Bell, her friends, colleagues and friends of Engaging Women who raised a solid $3,366.09 for Our Watch. We held this event less than two weeks ago and guests were informed that 17 Australian women had died this year at the hands of their intimate partners. We are now up to 20. Three more women added to this heartbreaking list, in such a short space of time. Read our interview with Our Watch Chair Natasha Stott Despoja here. 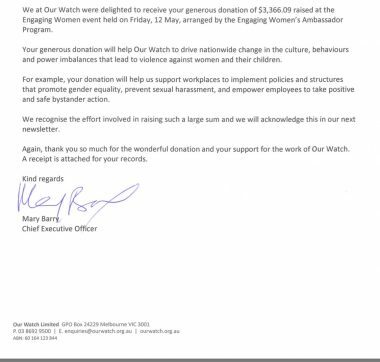 Our Watch CEO Mary Barry says this latest donation will help Our Watch drive nationwide change in the culture, behaviours and power imbalances that lead to violence against women and their children. Engaging Women is committed to raising awareness and giving other women and opportunity to extend a hand to women and children in crisis. Contact info@engagingwomen.com.au if you would like to hold your own event or find out how the program works. CHECK OUT OUR RECENT EVENTS HERE. And once again massive thanks to Nat Bell and your crew for digging deep on the night. If you or someone you know is impacted by sexual assault, domestic, or family violence, call 1800RESPECT on 1800 737 732. For information about local services, download the DAISY app. More info about Our Watch can be found here. 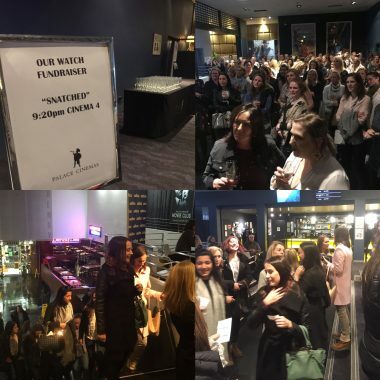 Tagged in Engaging Women blog ambassador program, Our Watch fundraiser.